Shiv Sena leader Bal Thackeray has died. Some Indians will only remember him as a "great man" who founded and led a regional political party. This is unfortunate, because he had the blood of more than a 1000 souls -- mostly Muslims -- on his hands. He should not be mourned, should not be honoured. The Srikrishna Report is clear just where the blame lies for the 1992-1993 riots. On the basis of the welter of evidence before him, the Judge concluded that "the communal passions of the Hindus were aroused to fever pitch by the inciting writings in (th e) print media, particularly Saamna and Navakal." "From 8th January 1993 at least," he concluded, "there is no doubt that the Shiv Sena and Shiv Sainiks took the lead in organising attacks on Muslims and their properties from the level of Shakha Pramukh to the Shiv Sena Pramukh Bal Thackeray who, like a veteran General, commanded his loyal Shiv Sainiks to retaliate by organised attacks against Muslims." He blamed "effete political leadership, vacillation for political reasons and conflicti ng orders issued to the Commissioner of Police" for the State's failure to contain the attacks on Mumbai's Muslims. Justice Srikrishna's observations were based on the mass of evidence before him. 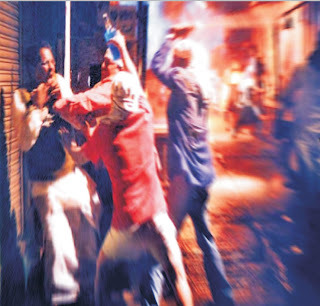 Dozens of witnesses before the Commission identified Shiv Sainiks as those who attacked them. Reshma Umar Makki, who converted to Islam when she married Umar Makki, had to h ide her husband when a mob of Shiv Sena workers attacked her home on January 9, 1993. Two days later, another vigilante group broke into her home, and "abused her as to why she got married to a 'landya', and whether all Hindus were dead." "She identified the mob," the Report records, "as comprising inmates of Andhra Chawl, out of whom she clearly recognised Umesh, a Shiv Sainik living near Sundar Hotel. He and three to four other boys entered her house, placed a chopper on her head, and threatened her that, if she spoke up, she would be stripped, raped and killed."